Memory – Mobile Friendly WordPress Blog Theme Created by Theme-Studio. 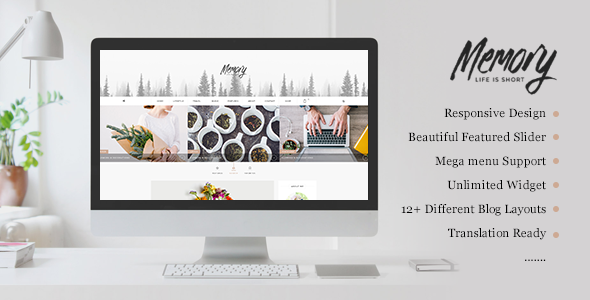 This templates have specific characteristics, namely: Memory – Mobile Friendly WordPress Blog Theme is a responsive WordPress blog theme which you can use for your blog as well as shop website. Memory is created to aim to give you an elegant, smoothly and MOBILE FRIENDLY theme to create blog, being passed by Google Mobile Friendly Test you can . You can use this Memory – Mobile Friendly WordPress Blog Theme on WordPress category for blog, blog theme, elegant, mobile friendly, personal, responsive, wordpress and another uses. Memory – Mobile Friendly WordPress Blog Theme is a responsive WordPress blog theme which you can use for your blog as well as shop website. Memory is created to aim to give you an elegant, smoothly and MOBILE FRIENDLY theme to create blog, being passed by Google Mobile Friendly Test you can confident with your website ranking higher than other competitors which is not passed Google Mobile Friendly Algorithm. Take it and enjoy! Video guide step by step installation Memory,check it to see how simple is it!! 1. Mobile Friendly (Responsive) Design with very clean and sharp. 4. Elegant and clean megamenu also built in create you very much space for your heavy content website and navigation, it also can include image, video and pretty much anything in to it. - Minor css fixes.- Bug with accordion shortcode .- Customize accent color style. - Add option to custom footer logo    - Add icon for megamenu.- Add custom url for top megamenu.- Add option include shortcode gallery in post.- Add link to featured image in slide.- Remove posttype Quote and Use postformat Quote.- Fix sidebar width set in MEMORY Options.- Add Custom height for header.- Add option change logo and background for login page. - Update Visual composer plugin version 4.5.2.- Fix minor css.- Fix button load more for style blog-grid.- Delete css inline.- Add config choose style (grid or standard) for category page.- Add link for feature post in style masonry.- Fix change width site and sidebar in all page.- The edited files :+ blog-masonry-sticky.php+ theme_option.php+ category.php (Add new).+ style.css. - New : One click import demo . - Update Woocommerce plugin latest version. - Fixed : Show/Hide social menu Option . - Fixed : Pagination for style blog list in homepage. - Fixed Recent post shows draft    - Fixed Product page layout broken.